Well, where to start with this beautiful evergreen day. The white florals are epic, the ceremony and reception set ups A.M.A.zing, and bride and groom Cassie and Tom are the absolute sweetest. Not to mention super stylish in their lace Justin Alexander bridal gown and navy check Hugo Boss suit. 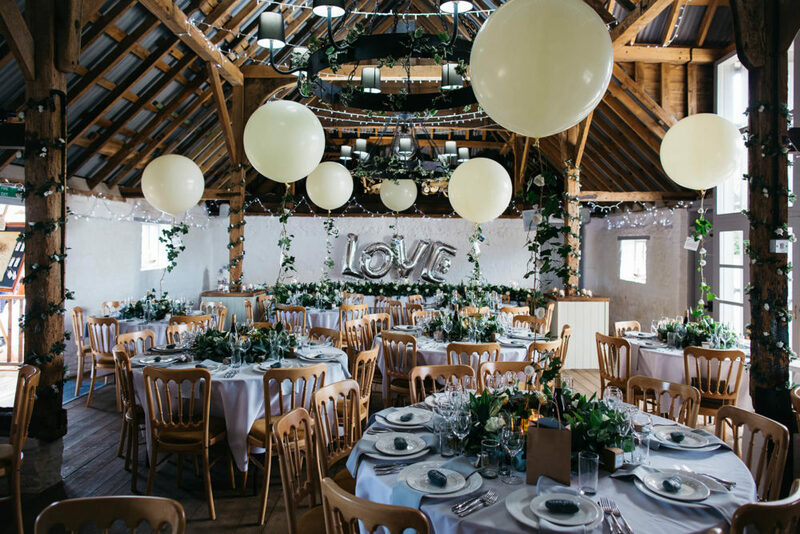 They incorporated many personal, and DIY details into their outdoor ceremony and barn reception, including candle and honey favours, polaroid picture name tags, as well as giant balloons, which not only decorated the barn but also made excellent props for the bridesmaid portraits. The wonderful Olegs Samsonovs’s Photography is vibrant, heartfelt and full of emotion. I never wanted to be in a bridesmaid selfie picture more. So sit back, relax and enjoy. 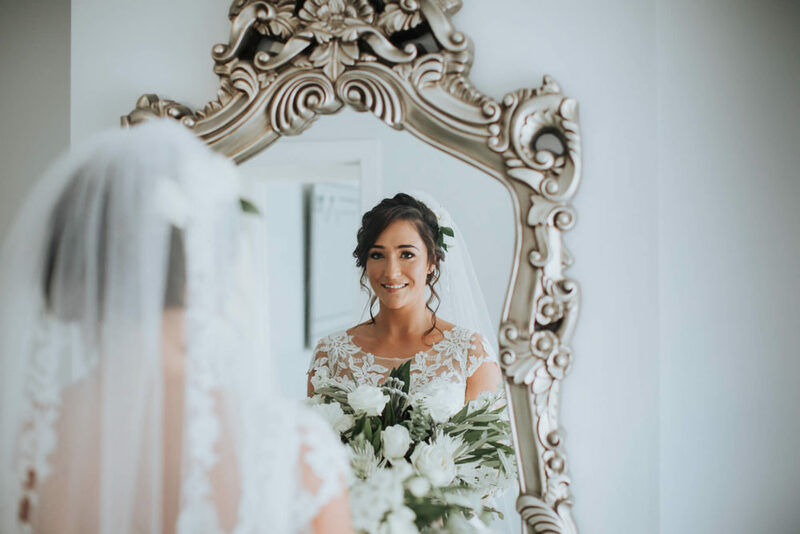 Cassie the Bride: When we started planning our wedding all we really knew was what we wanted it to be fun and laid back. Nothing too fancy but natural and effortless. We saw only one other venue before we visited the Red Barn and we knew immediately that it was the place for us. A beautiful blank canvas which we could dress in the natural style we wanted. It is a family run business which is really reflected in their laid back and friendly approach. 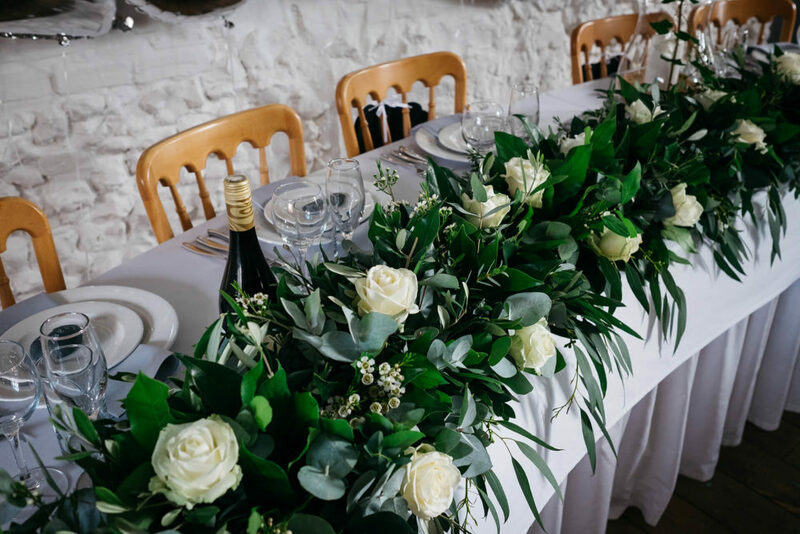 We used The 16th century main barn for the wedding breakfast and the second barn which is connected by a sheltered walkway has the bar and dance floor. The guests enter through the surrounding gardens to the pavilion where the ceremony was held. We wanted a simple, non religious ceremony that was a true reflection of us both. 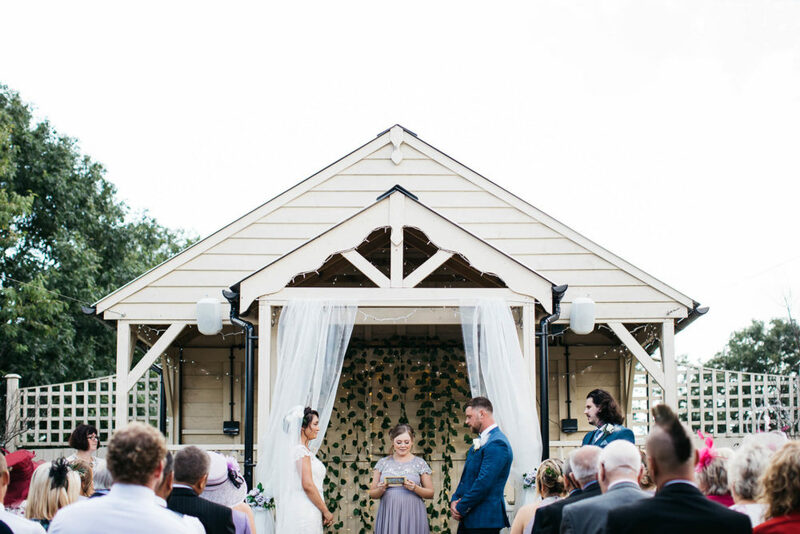 Our celebrant Karina O’Donnell from Simply Ceremonies Uk was fantastic and made us feel so comfortable even with the daunting task of writing our own vows. It’s hard to pick a favourite moment of the day but listening to Tom read the vows that he had written himself was truly special. I don’t think there were many dry eyes amongst our guests! 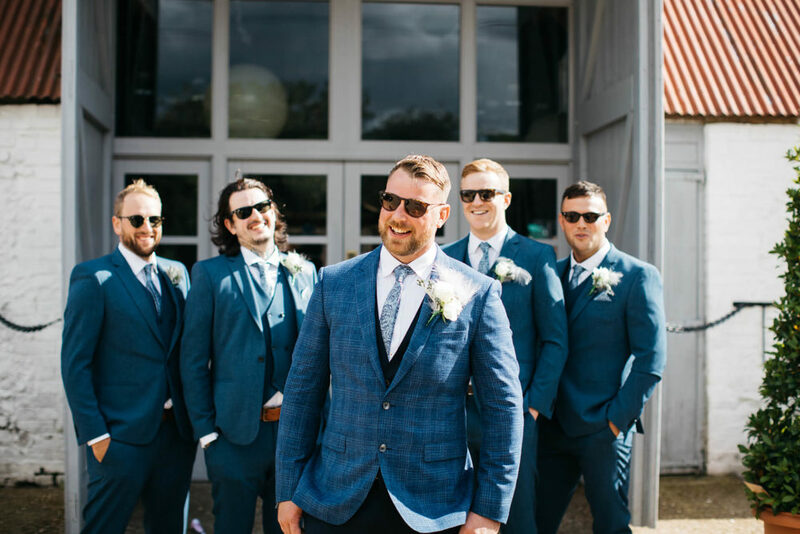 Being stereophonics fans we chose their version of ‘first time ever I saw your face’ (originally by Roberta Flack) for me to walk down the aisle to. ‘Ho hey’ by the Lumineers played whilst we signed the certificates. And Fat Boy Slim ‘Praise You’ as we walked back down the aisle. I quite quickly discovered a theme for the style of our wedding after looking around on Pinterest. I always knew it would be natural, organic, elegant and minimalist and I fell in love with the green, grey and white colour pallets. I wanted the key features to be the greenery and flowers creating a very natural and fresh feel. Luckily for us my mum Lorraine is amazing with flowers and agreed to take on the mammoth task of being our florist along with her friend Jackie. They made 9 bouquets, 15 buttonholes, 12 table wreaths and a 20 foot top table piece! My bouquet was the most amazing thing I’ve ever seen and the smell from the flowers and eucalyptus filled the barn. Along with the wonderful honey scent from my friends hand poured soy candles. Chelsea candle provided us with personalised wedding favours which the guests were crazy about to accompany small jars of honey made by my uncle John and his bees. I tried to use as many personal touches as I could, and also based some features around travel as that is something we love. The guest name places were stones we had collected from our favourite beach in Cornwall. The seating plan was a map and luggage tags, a table for every country we have visited together. The tables were identified with Polaroid’s of us in that country attached to the ivy vines which were hanging from giant balloons in the centre of each table. The real ivy vines had small felt roses made and sewn on to them by my cousin Tina from Dragonfly wishes. Toms Mum Julie is really creative and artistic and she made wands for guests to wave as we walked down the isle, giant dream catchers, and tissue paper flowers which decorated the seating plan and also the tipi which she made super cozy with rugs, cushions and fairy lights, a hit with the kids. The grown ups (men) loved the cigar bar which I had put together with bargains from charity shops and bootfairs. We went for a non traditional BBQ meal which included hog roast, Lamb chops and chicken with Mediterranean veg. The food was a massive hit with the guests and to this day people are still talking about Mikes crackling! In the evening he turned the left over pig into pulled pork with sausages which was perfect for guests to grab. A real meat fest! 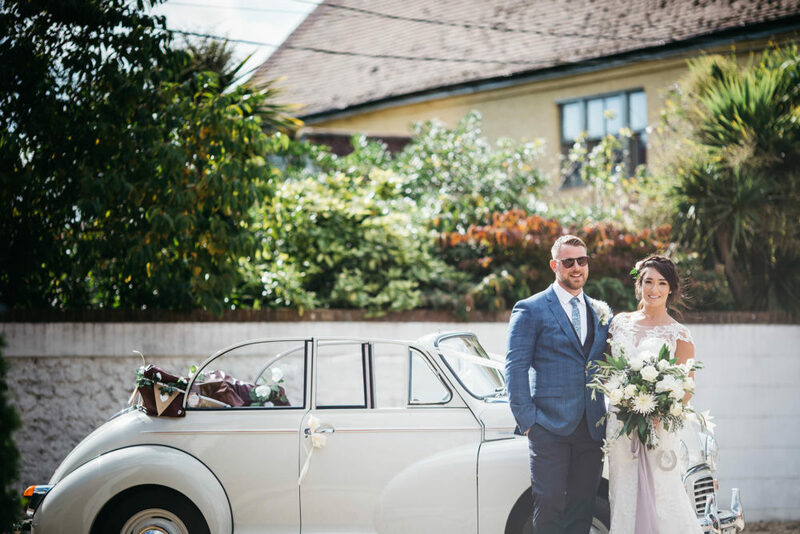 Kevin Iverson is an acoustic singer/ guitarist from our local area and provided the perfect atmosphere for us to enjoy Pimms and canapés to in the sunshine after the ceremony. For the evening music another local band from Dover called the Ratzkins kicked off the party with their cover of Stereophonics ‘Indian Summer’ which was our first dance. We partied till 1am forcing them to play more songs and eventually play DJ for the rest of the evening. We hired a vintage 1968 airstream trailer from Belle Studio for the photo booth which was one of the highlights of the evening. It looks amazing and was a unique way to capture the fun and craziness of our guests. We love looking back at the guest book they supplied. We knew from the moment we saw their work that we wanted Olegs and Rita to photograph our day. Posing for photographs was a daunting idea for us, but the pre wedding shoot with the couple put us totally at ease. We lit a fire on the beach and drank some whisky and really hit it off, they are fun, natural and creative. We knew our pictures would be amazing but they totally blew us away with the way that they captured every moment and emotion of the day without us even really being aware they were there. Olegs just blends in and makes the whole process completely organic and Rita works in the background paying attention to every detail. I still look back at the photos daily and am so grateful to them both. I feel like the photos will allow me to relive those feelings felt on the day forever. I felt like I knew what I wanted everything to look like until it came to myself. I’m pretty laid back and I wouldn’t say I have one particular style but I did think I would go for something loose with long sleeves. I was wrong! I took my mum and Nan shopping with me and I knew before I walked out from behind the curtain that they we’re going to know it was the one. The Justin Alexander gown was simple but yet different. I loved the thick almost wool looking lace, it was like no dress I had seen before and I felt very comfortable and confident in it. 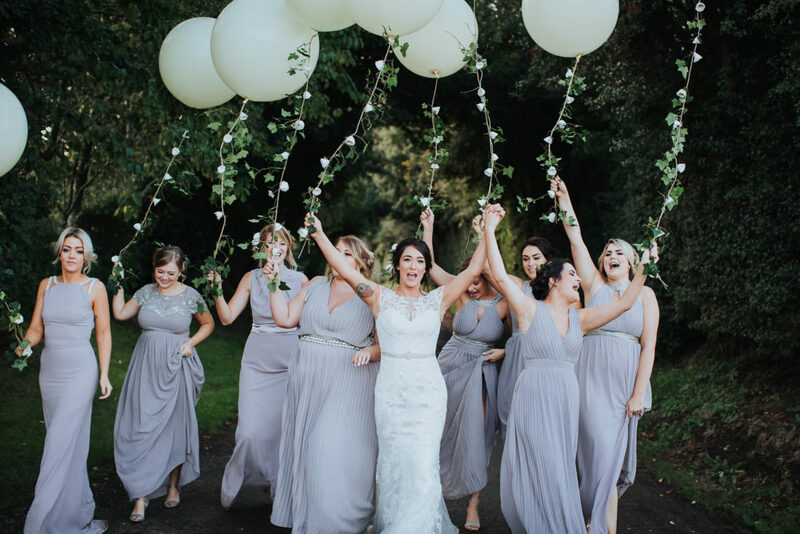 I was expecting it to be a challenge to find eight dresses for eight girls which are completely different shapes, sizes and personalities but it was a breeze! All I wanted was for them to feel comfortable and beautiful in their dress, I knew the colour scheme I wanted and TFNC happened to have a dress for each of them that they chose themselves. And they suited each girl’s personality perfectly. Seeing them all together on the day was one of the highlights for me. All so beautiful and happy. It was important to us that our guests enjoy themselves, and that we could enjoy it with them. And that we did. On the day all the small things you have been fretting about don’t seem to matter and it all turns out perfectly anyway. Don’t worry about pleasing everyone – it’s not physically possible, In the end it’s what you the two of you want that’s most important and your guests appreciate that. If you are going DIY for your day do not underestimate how time consuming the small details are the week of the wedding. I was so grateful that we had our venue for 4 days prior, I can’t imagine doing it all in one day! Beautiful wedding! Can you let me know where you got the kids tipi from please? 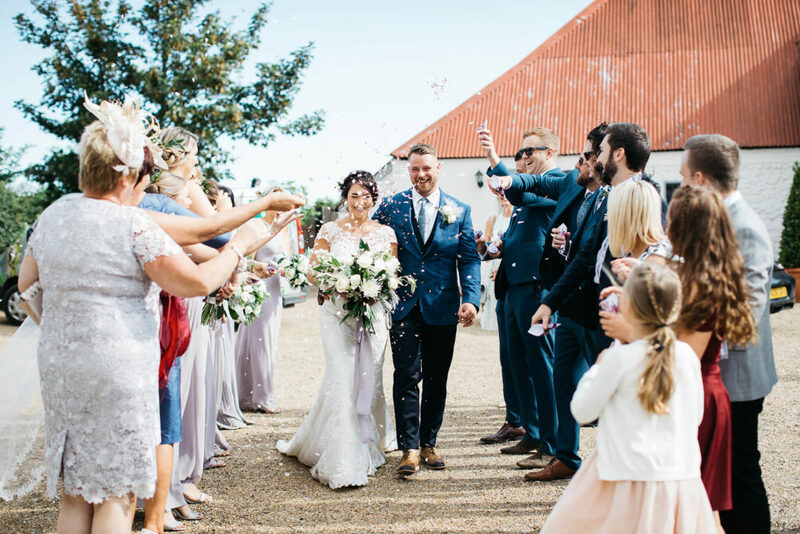 Thanks for featuring this amazing wedding! It was total joy to capture Cassie and Tom’s big day.